Indianapolis, Ind. 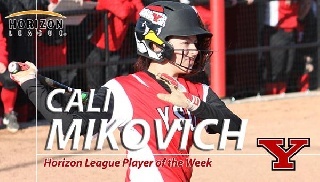 -- Youngstown State sophomore Cali Mikovich was named the Horizon League Softball Player of the Week, the league announced on Monday. This is Mikovich's second weekly award of the season and the second of her career. Mikovich batted .478 (11-for-23) with three home runs, 8 RBIs and 11 runs scored and led the Penguins to a 5-1 record on the week. She also posted a slugging percentage of .870. Mikovich broke the YSU single-season home run record on the final day of the regular season and has 12 on the year. She had a hit in all six games, including four multi-hit games. Mikovich went 2-for-4 with a home run and two RBIs in a 10-4 win over Detroit on May 3. She went 3-fopr-5 with two home runs, three runs scored and four RBIs in the regular-season finale against NKU. Against NKU, Mikovich went 7-for-13 (.538) with two homers, six runs scored and four RBIs. Mikovich tied for the Horizon League lead with 65 hits, ranked second with 12 home runs, 112 total bases and 50 runs scored, third with a .389 batting average and a .671 slugging percentage. The third-seeded Penguins face sixth-seeded Valparaiso in the first round of the Horizon League Championship, Wednesday, May 11, at 3:30 p.m. EDT.